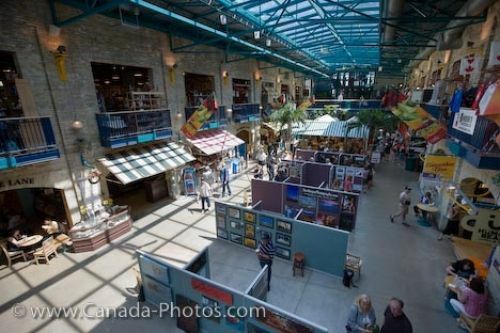 Inside The Forks Market in the city of Winnipeg, Manitoba in Canada, the bottom floor is filled with a variety of stalls during a photography exhibition. People stop to browse at each photography booth to find the right picture to take home and decorate their home or office. A photography exhibition is just one type held at The Forks Market, a venue which is always changing. Throughout the market, there are over 50 shops which promote a variety of goods, some selling clothes, jewelry, toys or artwork. Picture of people at the photography exhibition at The Forks Market in the City of Winnipeg, Manitoba in Canada. Interior of The Forks Market during a photography exhibition, The Forks - a National Historic Site, City of Winnipeg, Manitoba, Canada.